The Jets got DESTROYED by the lowly Broncos in Denver in a game that ELIMINATED the Jets from Playoff contention. NOBODY and I mean NOBODY thought the Jets were going to make the playoffs going into today’s game but the Broncos were on a EIGHT game losing streak, so with a win, the Jets could have kept their season ALIVE, but like the last 48 years, they were not able to get the job done. This season was SURPRISING for most Jet fans, like myself who thought they were going to be one of the WORST teams in the NFL, but they have actually played REALLY WELL this season, considering the YOUNG and inexperienced roster and that inexperience was EVIDENT today. The THREE remaining game for the Jets are against probable Playoff teams, so they are going to end their season 5-11, hopefully that is enough to get a TOP TEN draft pick. The Jets closed as the FAVORITES in this game and most experts believed that they would win this game and go into next week still ALIVE for the Playoffs, but it seemed like they DID NOT want to even play. They lost the game 23-0, which was their first shutout in over THREE years and there were no positives from this game. There were absolutely NO POSITIVES from this game instead the NEGATIVES kept piling on for them. Today was the first game where we saw one of the YOUNG quarterbacks on the Jets’ roster and it was not due to bad play of Josh McCown or anything. Bryce Petty was FORCED to come into the game after McCown suffered multiple injuries in the game, first to his HEAD and later to his HAND. 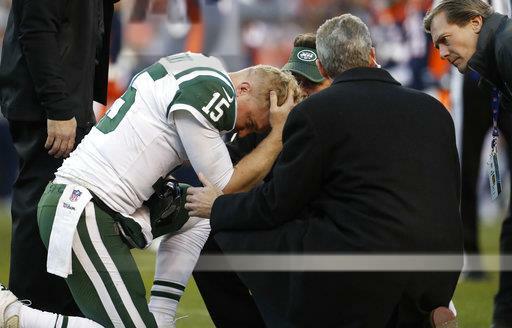 The second injury to McCown forced him to MISS the REST of the game when he suffered the HAND injury in the fourth quarter, turns out that he has BROKEN his HAND and might have to MISS some games. That will be the BIG question surrounding the team going into next week, WHO will be the starting quarterback in NEXT WEEK’s game against the Saints at HOME? Besides the quarterback position, this game was one that the whole TEAM would like to FORGET as there were DUMB plays made on both sides of the ball. The DEFENSE could not get a STOP early in the game and that SET the TONE for the rest of the game for them. The offense which has been playing really well lately, could not get a drive going and they NEVER came even close to field goal territory thus being SHUT OUT. As I said last week, the Broncos were the BEST CHANCE for the Jets to WIN a game the rest of the season, but now that they have LOST to them, you have to think they are going to end the season on a FOUR game losing streak. The next THREE games for the Jets are HOME against the Saints, HOME against the Chargers on Christmas Eve, and they close out the season on the ROAD in New England against the Pats. If the season ended today, TWO of the THREE teams would be IN the playoffs and I do think the Chargers will find a way to make it, so it is going to be HARD for the Jets to win a game the rest of the way. This season’s main GOAL for the Jets was to evaluate the YOUNG talent while tanking to get a HIGH draft pick. From the amount of Jets football I have SEEN, which is more than I would like to ADMIT, I do think that some of their YOUNG players have the talent to be really good in the NFL and should be part of the LONG TERM plans of the Jets, but they are not going to end up with as HIGH a draft as they would have liked, but I DO NOT think that is the end of the world. The quarterbacks in next year’s draft were SUPPOSED to be GREAT, but I do not any of them are GOOD ENOUGH to be the CORNERSTONE of a rebuilding process. IF the Jets had a GOOD quarterback than they would be on the BUBBLE for the Playoffs, so they need to put all of their focus on finding that quarterback who can possibly take the Jets to the PROMISED LAND and END their LONG Super Bowl drought. EVEN THOUGH the Jets are not going to WIN a game for the rest of the season, they should use that time to evaluate other YOUNG players on the roster to start getting ready for next season and beyond. Boy is it going to be MISERABLE watching the my beloved Jets get BEAT UP by GOOD teams the next THREE weeks.